1 Ltr LPG will give approx 0.8 to 0.9 mileage as petrol.For Eg: If a car on a petrol runs for 10 km the same will run for 9 km with 1 Ltr of LPG considering the lower cost of LPG 40% cost of savings could be expected. Auto gas-fuelled cars generates 96% less NOx than diesel and 68% less than petrol..Auto-gas emits 120 times less small particle emissions than diesel vehicles.So clean and improving Air Quality. 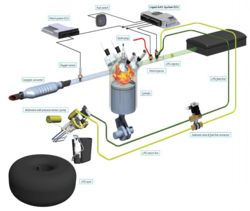 Accessible with us is a thorough scope of LPG Conversion Kit. Decisively outlined under the capable direction and skill of our experts, these items are made utilizing incomparable quality crude material, acquired from trusted sellers of the business. Notwithstanding this, our offered items are generally refreshing for their fuel effectiveness, elite and more administration life. Requested broadly in different vehicles commercial ventures, these items are made accessible to the clients at driving costs in the business sector. We are the Leading Manufacturer and Supplier of LPG Convertion Kit and its Spares.